support for community charitable causes voted on by area. Historia members have chosen to support Museums. Museums help preserve history, help us to remember who we are and where we have been. Enjoy getting involved and helping a museum in your area. Volunteer. Become a docent for you museum in an area of your own interests. Encourage others to go to the museum in your area. Take visitors there, help to chaperone school children. Write an article on your museum and submit it to a newspaper or magazine. Organize or participate in a fund raiser for your museum. If you have any more tips on how to help supporting Museums, email MuseClio and we'll add them to our list. Below is a "Historia, Supporting Museums" graphic for your site. Feel free to "right click save" it for your site. Be sure to link the graphic back to this page. Do you have a photo of you participating in your community helping Support Museums? Email it in and we will feature it and link it back to your web site! This month's featured photo, comes from Girl Scout Troop 1058 of Boulder Creek, California. 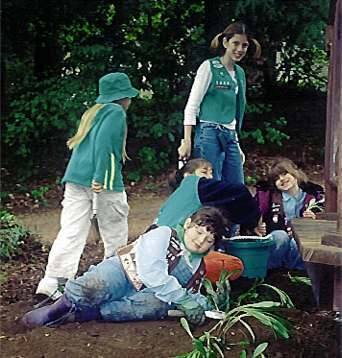 The girls are shown planting flowers to help landscape the yard of their local museum run by the Boulder Creek Historical Society. Good job! Be sure to visit their site in Historia. Please e-mail Athena with your suggestion for Historia. Thank you!